An adventurous young Bartholomew Webcravbensonite, descendant of Alexander the Great, learns an ancient book possesses the soul of his great grandfather. Young Bartholomew's great grandfather reveals a secret inheritance that lies in the perilous caverns of Dobinni. He retraces his great grandfather's footsteps on an exciting journey, and in doing so, continues his grandfather's legacy. Unlock the mystery of Atlantis, journey to a hidden Kingdom in the sky and make some shocking discoveries en route to Dobinni that will leave you speechless and all-the-more intrigued. 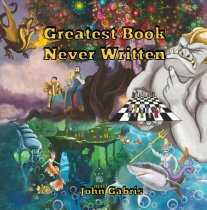 The Greatest Book Never Written explores the idea of immortality, the dangers of materialism, courage and perseverance.